I just felt like sharing another composition of amazing light and shadow reflections taken at the skyscrapers on Hagenholzstrasse; a kind of sequel to the photograph shown earlier this week. The whole building complex has just been completed and it is really nearby - I can even see parts of it from our kitchen window. This year, I try to broaden my view (I photograph more often with a wide-angle lens) and thus search for wide, complex scenes instead of tiny details. I often find them in reflections and particularly at these skyscrapers. In my opinion, the reflections and re-reflection in the composition above are quite amazing. 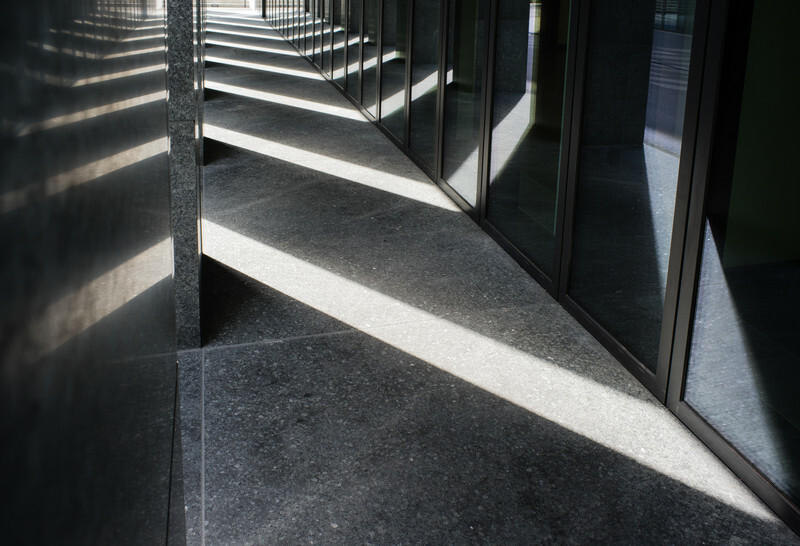 First of all, the original light and shadow pattern is reflected both, in the glass panes on the right, as well as on the granite pillars on the left. In addition, in the upper left part of the photograph, the reflection in the glass panes is re-reflected on the shiny granite. Since my reflection photographs are quite different in style (much more colorful), this composition has just been added to the light and shadow gallery as well as to the nearby collection.